Get this used Rovema VPUS-220 bagger to help increase the productivity in your packaging lines. This vertical form fill and seal packaging machine offers high speed bagging of up to 100 packages per minute and work with a variety of bag sizes from a few inches to more than a foot. If you need a VFFS bagger with film registration and side belt pull downs, featuring dual roll unwind, then your needs are met with this Rovema VPUS-220. Whether your application requires food or non-food products, this bagger will help maximize your product line efficiency. 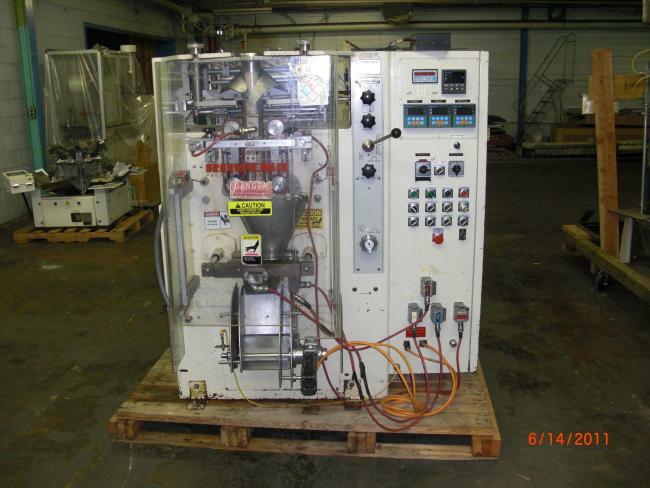 At the buyer’s request, High Performance Packaging can fully recondition this machine for optimal use. Check out our many other types of used packaging machinery as well, including top quality VFFS baggers. Need operator training to ensure that your employees know how to properly utilize all of your product line’s equipment? In addition to the equipment itself, we offer training services to help keep your business working with the highest level of productivity. Training is offered for every type of equipment, including all form, fill and seal equipment. If you have any packaging equipment you would like to sell, we’re happy to purchase your used machinery. We restore all of the equipment we receive to working condition and help prevent unnecessary expenses used on the production and selling of new packaging machinery.